LIVEENSURE IS MOBILE TRUST FOR YOUR CROWD IN THE CLOUD. The Authentication API. All Trust. No Passwords. LiveEnsure® is the next-generation security technology for developers that privately authenticate users through a triangulation of their mobile device, location, knowledge and behavioral context. It&apos;s incredibly easy to use with flexible APIs, mobile libraries, free mobile apps and realtime control. From one API you get multiple factors of authentication with no friction and 100% trust. Demo it now on your own mobile device (iOS/Android/Win). Multiple Factors of Contextual Authentication. LiveEnsure® security authenticates users in real time via their smart device. It goes beyond tokens, certs, PINs, OTPs, push or passwords. 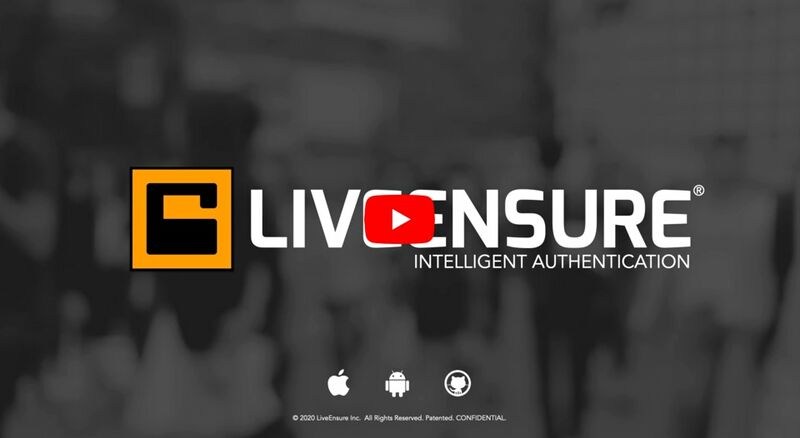 LiveEnsure® is strong, seamless multi-factor verification of the device, location, knowledge and behavior in context with an elegant user experience and individual privacy. Instead of crafting home-grown solutions or relying on vendors who infiltrate your identity stack, LiveEnsure® is simple trust API that gives you the power to verify your users across multiple factors with a single call. Try the demo now. Developers can offer their users strong but private authentication by simply mashing up a few lines of code with their site, app, SSO, social login, payment, device or other securable endpoint. Get rid of traditional passwords, 2FA and captcha altogether with a single API. There are no confusing tokens, certs or push messages. Just a simple call, present and poll API to our cloud authentication service. Check out the SDK on GitHub. Users can also download the free mobile app for their iOS or Android smart device and scan, tap or roll app-to-app to authenticate the next time they log in. No phone number, email or other account required. LiveEnsure® can authenticate users without having to re-identify them. There are no passwords and nothing about their identity is stored, seeded or sent back over the Net. There are no tokens, personas or keychains to manage. Get the app. Watch as LiveEnsure® authenticates users in over 80 countries around the globe via their device, location, behavior and knowledge. Developers, to get started with your site or app, register now. To stay in touch, visit our blog. A server or app and a few lines of code. LiveEnsure® API integration is simple. As a developer, you need a published site or app with a login form or SSO. Get your API keys and mashup the SDK code with your login flow. Call the API when the user logs in, present the object and poll for status. Mash up in just minutes. Visit support or Github to learn more. A smart device and the free app. The LiveEnsure® end user requirement is a smart device with either your integrated app, or our free mobile app. Users launch it app-to-app from within their mobile. The LiveEnsure® app can be downloaded from the App Store for iOS devices and the Google Play store for Android. © 2014-2019 LiveEnsure Inc. Patented US/EU. LiveEnsure® is the interactive authentication company. We develop mobile security technology for web, cloud and apps on iOS and Android. Trust your crowd in the cloud.